Have you been wishing you could become a freelance writer? If you wonder how to get started, or how to find good-paying gigs in today’s fast-changing marketplace, this e-book is for you! Start Here: 40 Freelance Writers Share brings together the best success stories featured on the Make a Living Writing blog over the past three years. Most of the authors are new to freelance writing, and share how they broke through and discovered how to earn a real living as a writer. 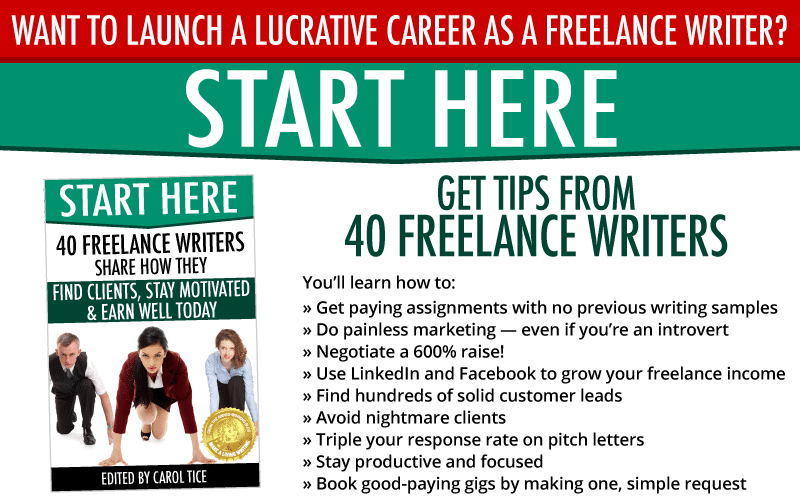 This e-book brings you more than 150 pages of advice from over 40 freelance writers, most of whom are new to the field. It’s a compendium of practical tips on how to find those first gigs, move up to great-paying clients, negotiate a better deal, use social media to find clients, and much more. P.S. When you purchase Start Here: 40 Freelance Writers Share, we send you a bundle of all three popular e-book formats with your purchase — PDF, Mobi and ePub. Read, use, and enjoy on the device of your choice.